A tad less indulgent, but equally delicious. Don’t take our word for it, give these healthy dessert ideas a whirl. 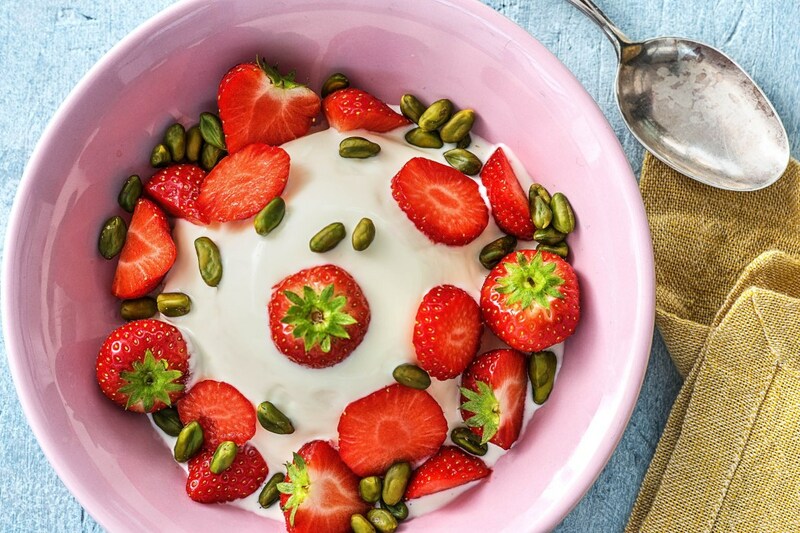 These seven better-for-you desserts work double duty — satisfying your sweet tooth while also keeping your health goals on track. For the most part, each recipe calls for unrefined sources of sugar (think honey, maple syrup, or dates) and features a hidden fruit, veggie, or legume. So get excited about these seven stunning healthy dessert ideas, including seasonal fruit platters, chocolate “nice” cream, avocado tartlets, and even black bean brownies. The no-bake, mini tart has arrived. It’s called a tartlet, and it comes together with the help of some of the usual baking suspects (coconut, almonds, dates, lemon, honey) and one unexpected but very welcome guest: avocados. Get the recipe here — we have a feeling you won’t be able to say avocad-no! We know, sometimes you need a bowl of mint chip… and the chocolate syrup that goes on top. We support you, but we’re also excited to fill you in on “nice” cream: a super healthy, banana-based alternative that comes with all the sweet and yummy you crave without any of the cavities — and we’ve got the super simple recipes to prove it. Sweetened only with honey and bulked up with a mixture of protein-packed almonds and cashews, these bars are a perfect post-dinner treat or afternoon snack. Add all ingredients to in a large bowl. Stir well to combine. Sprinkle with coconut flakes before refrigerating for 2-4 hours. When the natural sweetness of apples meets the warming, aromatic flavours of cinnamon, not much added sugar is necessary — which is why this crepe recipe has earned a well-deserved spot on our list of healthy dessert ideas. To make filling, melt butter in a skillet. Add apples and sauté, stirring occasionally, until they begin to soften, 3-4 minutes. Sprinkle with cinnamon and cook until apples begin to brown, 4-5 minutes. Pour in apple cider and cook another 2-3 minutes. Set aside. With the help of a few key ingredient swaps (whole wheat flour for white flour, applesauce for sugar), you’ll feel even better reaching for seconds. Because let’s be honest, one is never enough. Preheat oven to 350°. Lightly coat an 8 x 8-inch baking pan with nonstick cooking spray and set aside. Zest 1 orange. Place black beans in a food processor, and process until smooth and creamy. Add eggs, applesauce, sugar, cocoa powder, vanilla, baking powder, salt, orange zest, and ground coffee. Process until smooth. Add ¼ cup chocolate chips, and pulse a few times until chocolate is incorporated. Pour batter into prepared pan, smooth top with a rubber spatula, and sprinkle with remaining ¼ cup chocolate chips. Bake 30–35 minutes, or until edges start to pull away from sides of the pan and a toothpick inserted in the center comes out clean. Cool in pan before slicing into 2-inch squares. Brighten up your dessert spread with in-season citruses, like grapefruit, blood oranges, clementines, and ordinary oranges. Slice ’em thin and arrange into layers for a #HelloFreshLife worthy presentation. As we move into the warmer months, feel free to experiment with seasonal berries, pineapple, melon, grapes, and kiwi. Arrange in a circular pattern or separate by colour for a rainbow platter that’ll get even the pickiest of eaters excited about fruit. This no-bake recipe is perfect to flex your fruit topping skills. While we LOVE the strawberries in this dish, we encourage you to get a bit creative with your fruit combos. If we’re being honest, this dish is not completely healthy since it features sugar and whipping cream — so let’s just call this a treat you’ve earned! Get this creamy yet fruity recipe here. These healthy dessert ideas will definitely satisfy your sweet tooth, but if you’re in seek of a dessert that’s a bit more indulgent, look no further! Give these Lemon Berry Swirl Mini Cheesecakes a try!